Monogrammed backpacks this year are not just for a school girl or for camping! Right now they are designer HOT. And once you grab ahold of the convenience and comfort of these stylish numbers, staying on trend will be a breeze. According to Vogue, “the piece acts more like the cleverest purse in the world than the standard hallway-blocker”. 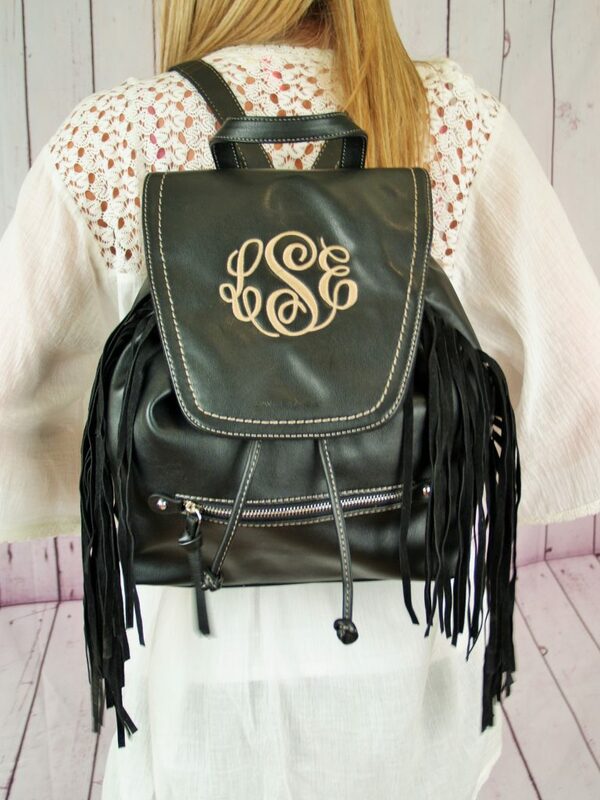 At I Flew the Nest we have picked out some perfect monogrammed backpack purses necessary for all fashionistas. If you are looking to accent your look with some fringe, check out our monogrammed fringed backpack. Or, if Boho is more your style, our Aztec printed monogrammed backpack purse is where street meets style! Ready or not for fall…. I Flew the Nest has got you covered with fashion! The fringe definitely transitions the backpack into the very practical purse category AND it’s cute! I love the hardware on this backpack. The fringe, zipper and tassels set it apart, even before the monogramming.